Approx. 2mm thick. 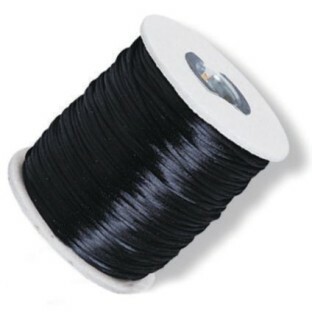 144-yard spool. Cord is 65% rayon, 35% cotton. Our camp kids LOVE making the keychain beadie projects to match our theme of the season. This cord is the best as it is strong yet flexible making the bead projects easy and well done. We always roll the ends in white glue the night before to make needles for easy threading through beads. Although a bit higher priced than other string that could be used we find it the best and worth it. love this for all my necklaces! This cord looks very expensive but it's not! it lasts and lasts and does not fray. I LOVE IT! Perfect cord for stringing beads for a pre-k project. Great price for the amount that you get. Was able to make 35 necklaces. Good product. I used this to make the tie offs for some dice bags I made for friends. It's very high quality and very well priced. Should I ever actually finish off the role I would buy it again.